Among its many other aspects, The Mendelssohn Project is an education project. The Mendelssohn Project feels deeply committed to the Family and Children Oriented Materials ideas it has developed. While having as its base the recording of the complete music by Felix Mendelssohn Bartholdy on 120 CDs – many of which will be first time recordings – as well as over 80 CDs of the unknown music of Fanny Mendelssohn, TMP has derived vast educational components from the lives of both the Mendelssohns, which start with music and extend in many new and surprising directions. All of the educational materials and ideas within The Mendelssohn Project are based purely on, and emanate out of, the fascinating, high-powered, at times scandalous, and always intriguing life of Felix and Fanny Mendelssohn and the rest of their family. Since the story of the Mendelssohns' lives was so rich in its intrigue, scandal and sexual passion, it lends itself to a variety of film and television documentary ideas. Currently, TMP has developed three full original treatments which are based solely on fact, but have the power and universal appeal to attract a large cross-over audience. In addition, having been the pop-music of their time, Felix and Fanny Mendelssohn's music lend themselves quite naturally to the screen. TMP very much sees an audience in the popular market and also intends to pursue the concept of developing MTV-like Music Videos attractive to various interests and ages. The Mendelssohn Project is also developing The Show, which will tell the story of the Mendelssohns' lives in a unique fashion, combining a split-stage concept with live music, world-premieres, and top actors and top musicians. This show is meant to appeal to the young and the old, and to the classical-music lover and the non-classical-music fan. A series of Interactive DVDs will be placed on the market over the next few years. Clearly, many of these items would be educational in nature. 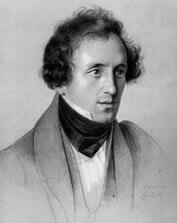 The topics would range from scholarly ones, such as a Life and Works Chronicle and other archival matters, to Interactive Biographies, and studies of Mendelssohn's compositional process – all in forms understandable for a seasoned composer, as well as for a young child and at other levels in between. The obvious inclusion of Print Materials would include spinoffs from the core base for adults to be tailored, or re-fashioned, especially for the school and educational market, such as a book about the anti-Semitism which relegated Felix Mendelssohn to obscurity just years after his death, to a book about the salon concerts which Fanny Mendelssohn created in Berlin, to a book of poems and anecdotes collected from both composers' letters and manuscripts, to a coffee-table book of the over 300 artworks by Felix Mendelssohn, and a book of his serious prose and theater writings. A book for younger audiences on Felix Mendelssohn's role as the first modern conductor, and one on Fanny Mendelssohn's being relegated to the shadows, as she neared maturity in order to prepare for her 'proper' life as a housewife and mother, are also in the planning stages. Other ideas being formulated include a traveling series of children's concerts, which would help derive larger in classical music – not just from the children themselves, but also from the adults surrounding them, and various audio books, animated cartoon books, and toys and games for children of all ages.